Neither the constant growth in the amount of websites that choose WordPress nor its dominant position in the market have made the WordPress development community relax. WordPress is going to change a lot in a very short time. 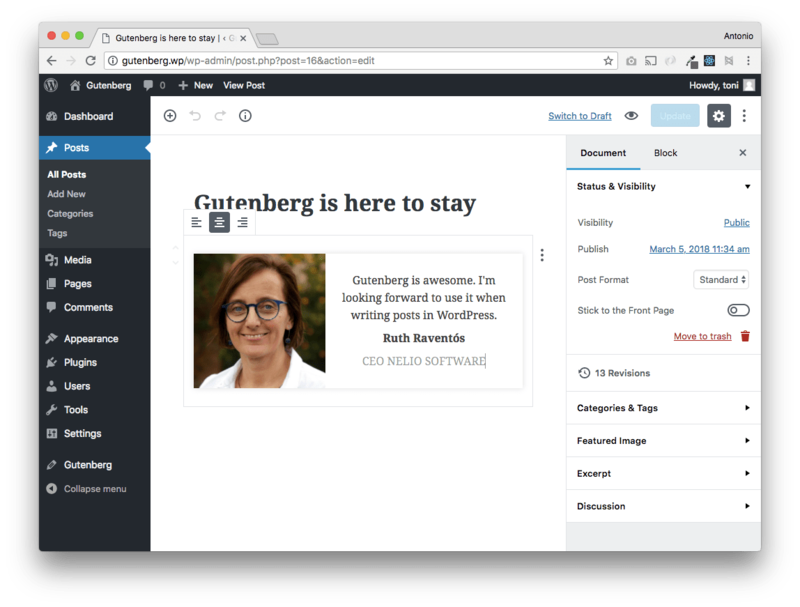 And the biggest change in WordPress is called Gutenberg. In this article I’m going to talk about Gutenberg and I’m going to show you how to get involved in its development by creating your first block, a concept that you will certainly have to master if you plan to continue earning a living with WordPress for years to come. Let’s get started! 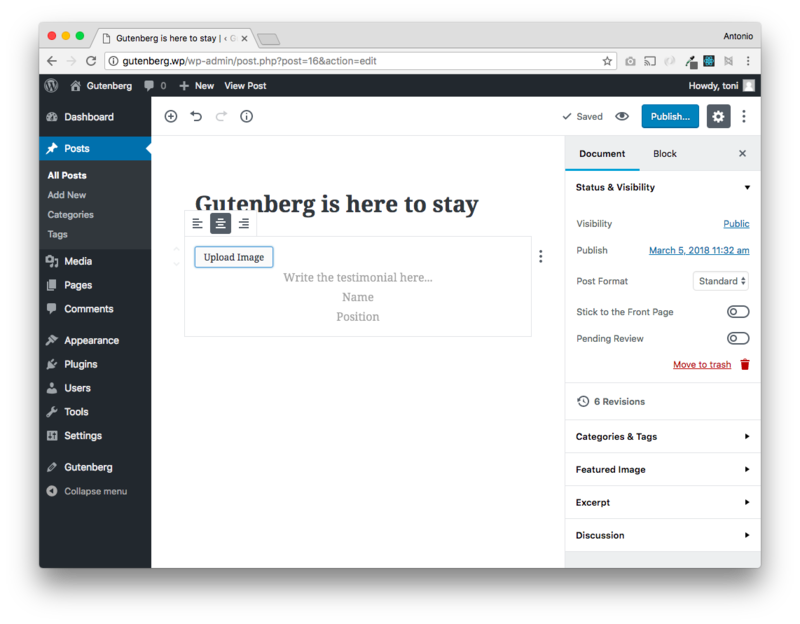 Gutenberg is the new content editor for WordPress. But it’s much more than that. 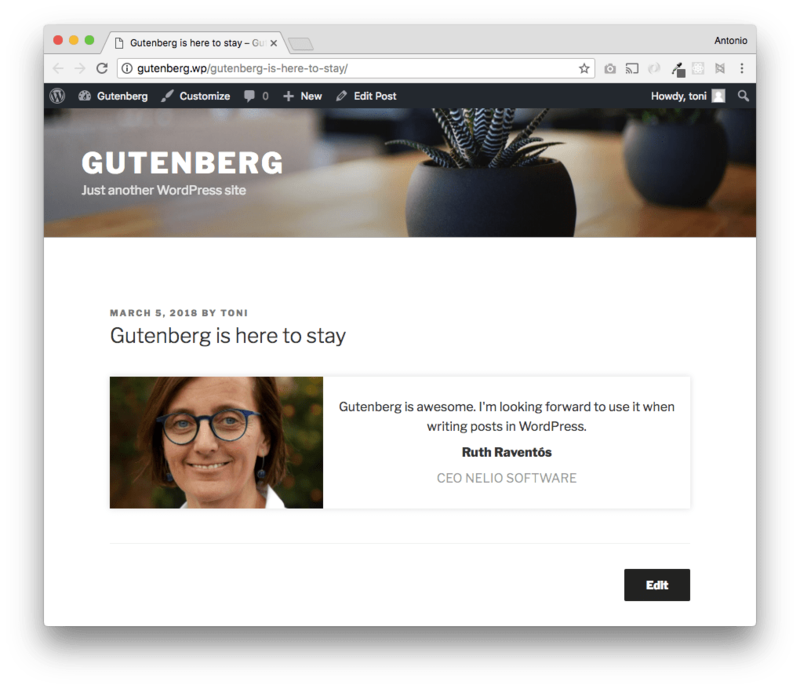 Gutenberg will change the way users and developers work with WordPress. So far you’ve used WordPress‘ editor as if it were a Microsoft Word document. Well, this is about to change as the concept of block appears on the scene. Now your WordPress content will be composed of blocks—you’ll have blocks for paragraphs, images, headers, quotes, and more. In addition, the developer community will go crazy by creating plugins that add new custom blocks. Also, keep in mind that Gutenberg won’t only be the editor in WordPress—in future development iterations, the block concept will replace other familiar concepts in WordPress such as widgets and menus. Soon WordPress will be all blocks. And that’s why I’m interested in teaching you how to create a basic block today. 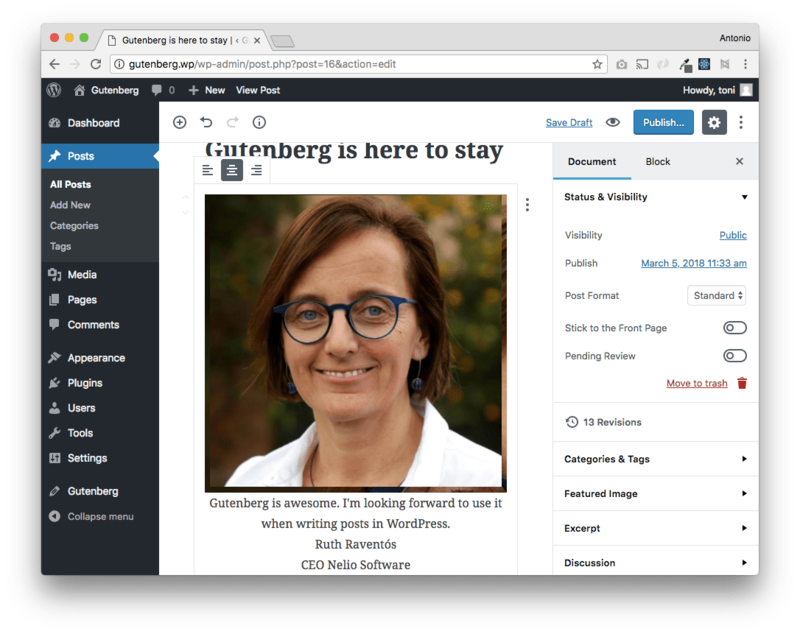 It’s said that Gutenberg will be ready to be included in WordPress version 5.0 by April 2018. But I think we’re gonna have to wait a little longer until Gutenberg ends up inside WordPress. Right now if you want to try Gutenberg you will have to install a plugin. But be careful, I don’t recommend you to do it in your production WordPress installation, since it’s still under development and you can break things. Try it in a test installation instead. Screenshot of the Gutenberg editor. Mockup of the new testimonial block we want to add to WordPress. File structure for the plugin that adds the testimonial block in Gutenberg. block/testomonial/index.php is responsible for enqueueing the files that define the block and displaying it in both the backend and the WordPress frontend. block/testimonial/block.js defines the testimonial block itself and its behavior when editing and saving it. It’s the most important “Gutenberg-related” file in regarding the block. block/testimonial/editor.css contains CSS rules for styling the blog in the Gutenberg editor. block/testimonial/style.css contains CSS rules for styling the blog in the frontend, when a user accesses your site and views the final result. 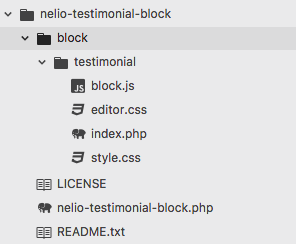 nelio-testimonial-block.php is the plugin‘s main file, where you define the headers needed to describe the plugin and include the previous index.php file. If you’ve ever created a WordPress plugin, you’re already familiar with it. You can see it here. You’ll find all the code of the testimonial block in GitHub. Note that we basically use two hooks: enqueue_block_editor_assets and enqueue_block_assets. The first hook is for including the files we use within the Gutenberg editor: block.js and editor.css. It’s also worth noting that block.js file has some dependencies (wp-blocks, wp-i18n, and wp-element), which are necessary if you want to create a block like ours and internationalize it. The second hook simply enqueues the frontend styles: style.css. name: name of the person who writes the testimonial. position: job of that person. testimonial: the text of the testimonial. mediaID: ID of the image in the WordPress media library. mediaURL: URL of the image of the person. alignment: arrangement of the text in the testimonial. One important thing to keep in mind is the following: any attribute that has an HTML element associated with it needs a unique selector, or Gutenberg will give you an error when opening the content. Thus, if for example we have several attributes that are associated with <p> tags inside the block, we must have a different selector for each one (you can do it with different CSS class names). Finally we have the editing and saving functions of the block. Let’s take a closer look at them both! It looks very complicated, but trust me, it isn’t—they’re only a bunch of React components. Essentially, we create the HTML structure by nesting elements with the function el(). For example, if you look at lines 79 to 91, you will see that we define the <p> tag containing the position of the person making the testimonial. We define the class of the element (nelio-testimonial-position), a placeholder to show (Position, which is translatable), the value of the element (which we take from the previously-defined block attributes), and the onChange and onFocus functions (to update the value of the attribute and control its focus). This pattern repeats over and over again. There are, however, some additional peculiarities. For instance, there’s a button to open the image selector of the media library on lines 37 to 47. This uses blocks.MediaUpload, a reusable component of Gutenberg himself. In lines 22 to 30 we also reuse another another reusable component: the bar where you can change the alignment of the text. Notice that we built a div element that contains two more divs inside. The first has the image of the testimonial and the second the three paragraphs with the text of the testimonial, the name of the person who says the testimonial, and his position. Block for the testimonial without CSS styles for the editor (editor.css is empty). If we add content to the block, we see that the image makes everything overflow. There are no CSS styles defined. What our visitors see is not what we wanted in our initial mockup. We must use CSS because style.css is empty. To improve the way this block looks and make it more user friendly we need to add some styles. Remember those files we enqueued at the beginning? Exactly, we’re talking about the editor.css and style.css files! Well, it’s time to tweak them so that things look beautiful. By adding CSS to the editor.css we can achieve something much more similar to what we had sketched in our mockup. Visitors to our website will see the block correctly when we add the appropriate CSS styles to style.css. Creating a new block in Gutenberg can be complicated, but it’s easier than expected if you go step by step. Once you’ve encoded the basic stuff, you only need to work with three files, basically. The other two important files are those that define the styles of both the editor and the frontend: editor.css and style.css. You have already seen that a little bit of CSS can give a radical change to the final result. I encourage you to test the code and improve it. Before I finish, let me leave you with a list of interesting resources in case you want to learn more about Gutenberg. Remember that Gutenberg will arrive soon, and we should be ready for it! The Gutenberg handbook. The resource par excellence. Perfect as a reference. Zac Gordon’s Gutenberg development course. If you are one of those who prefer a step-by-step course, this is the most complete one you will find to date. Ahmad Awais Gutenberg boilerplate. 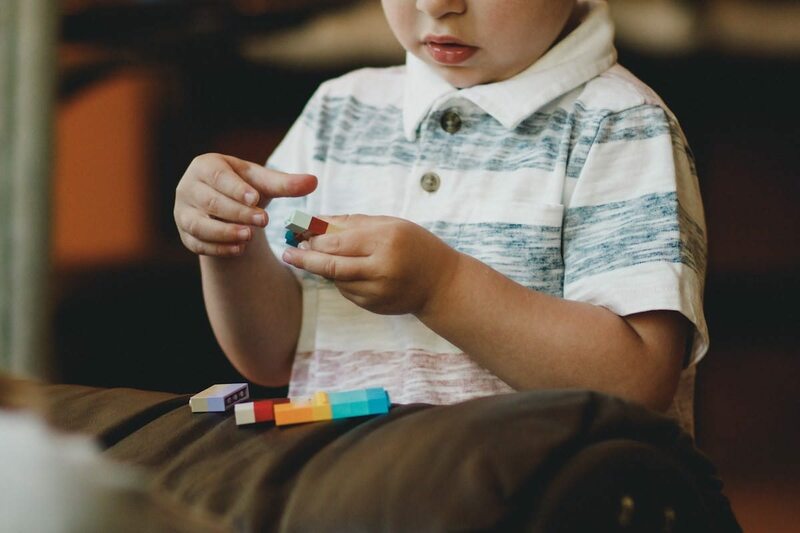 If you want to start developing your blocks, here are some basic examples from Ahmad Awais. Gutenberg examples on Github. More examples of block development for Gutenberg. Gutenberg design basics. If you are a designer, don’t miss this post by Tammie Lister, one of Gutenberg’s lead designers. Organic Themes tutorial. An incredible tutorial I used to create this one. I highly recommend it! Gutenberg News. 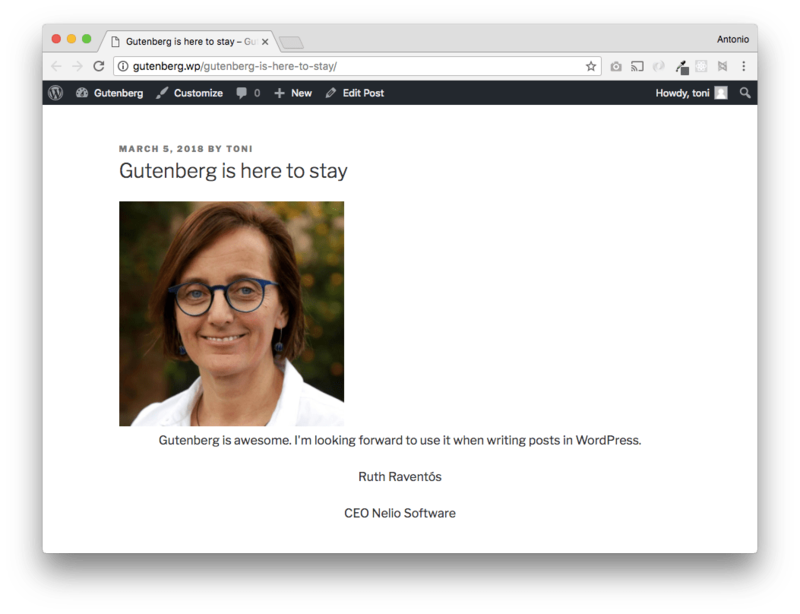 If you don’t want to miss any news about Gutenberg, you should follow this news website. Featured Image by Caleb Woods on Unsplash. After several readings on the subject of Gutenberg, I realized my epiphany on the whole concept of blocks after your post and I thank you for it! Since the first goal of a block is to be displayed with simple html and css, the webpack, React and Babel machinery required behind the scene seems simply disproportionate. In this light, your proposal for refactoring the testimonial block using JSX in a future post could be still quite interesting and, importantly, how would you feel about the whole experience, comparing both methods. Could you give me a hint how to transform a shortcode into a Gutenberg block? I understand that the shortcode parameters could be saved to the database with the “save” method. But how is that information later retrieved when rendering that block on the frontend and how would I call the PHP method that renders the actual shortcode content? The HTML cannot already be rendered in the editor, it should be dynamically created when someone views the page. I noticed that there is a “shortcode” block, which I could modify. But this block still seems to rely on shortcodes, and since they will be retired in future, I am searching for a “Gutenberg way” to go about it. Thanks! Hi Chris. The edit method deals with the way in which you display the block in the editor and the save method deals with the way the block is stored (as HTML) in the post content. Read the full example and try to execute it in your local WordPress installation. After that, you’ll probably get a basic idea of how it works. That way you’ll be able to replicate the shortcode behavior as a block. Hello, thank you for your tutorial. Only in the frontend the element gets displayed correctly (just the border of it without any content). I am working with the latest gutenberg version. Hi Lukas. I’ve made some changes in the source code on GitHub. Take a look at it because that probably fixes your issues. Thank you for your recent fix, it is working now like a charm. What I was searching in the meantime was a solution that custom image sizes are loaded, not always the full size image. I already talked to some experts but they were not able to say if there is any solution for plugins, like the stadard image block are using. Would this be possible to make? Do you know more about this? Hi Lukas. I’m not sure how to get the proper image size. Looking at the project in GitHub it seems that there is still work to do on this direction. Honestly, more documentation about it is necessary. I think we should wait until then or go to Slack and ask the Gutenberg developers directly. After some time of struggle, I found that blocks.RichText now needs to be changed now to wp.editor.RichText (due to recent changes in the API, I guess). You can pass “wp.editor” to the function as “editor,” then use editor.RichText to match what is done with the “blocks” variable.